Three flavours of Extra Dessert Delights chewing gum, found in Seattle. One of the pleasures of travelling south of the border is checking out curious chewing gum flavours that have yet to make it to Canada, or that, for some reason, will never put in an appearance in the frozen north. These three Extra gums stood out at the counter of a Seattle gas station, and I knew I needed to try them. Strawberry Shortcake: A creamy strawberry. Reminds me of the strawberry flavour of Japanese candy Hi-Chew. A little bit of tea, and some slight minty flavour for freshening. Not bad. The least unique of the three flavours. Key Lime Pie: OK. So, this is crazy. It doesn’t just taste like lime – it tastes almost exactly like key lime pie. The filling, the crust, everything. Really good, though strange enough that I wouldn’t keep it around as an everyday gum. Not meant to fight bad breath, but freakishly life-like in key-lime flavour. Mint Chocolate Chip: On first contact with the tongue, there’s a tiny hint of artificial watermelon. Then it opens up into a full-on mint and chocolate assault. It’s like crewing a piece of mint gum after eating a chocolate bar. The chocolate tastes artificial, but it still works fine in the gum. Cost: $1.59 for each pack of gum at a gas station. Value for cash money: Par for the course. Not bad at all. Nutrition? : 5 calories per stick. But does the flavour last? : Yes. Yes, it does. Quite a long time. 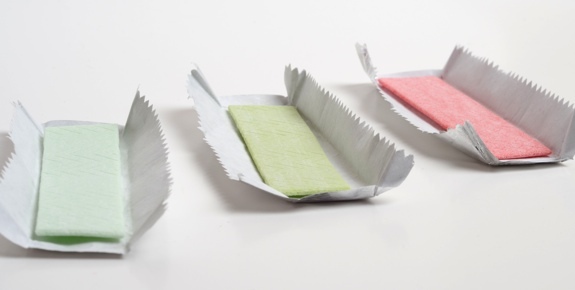 Packaging: The packaging is the same 15-piece type made popular by 5 gum, also from Wrigley. I like it. It’s easy to carry around in a jacket pocket or in a messenger bag. The verdict: Delicious. An occasional indulgence, not the kind of everyday, garden-variety gum you keep in your bag/purse for use as a breath freshener. If they become available in Canada, I’ll happily buy them again. Extra Dessert Delights chewing gum, from left: Mint Chocolate Chip, Key Lime Pie, Strawberry Shortcake. They must be using 10 year kids to pick out the flavors of the gum. The Extra Dessert Delights are horrible. They are first of all way too sweet, and second the flavors are just bad. 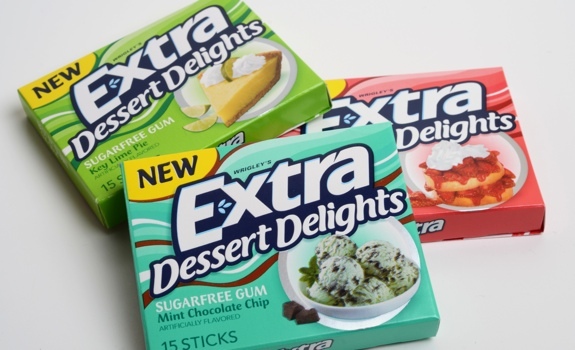 In the meantime, i noticed that Extra is slowly discontinuing all the fruit flavors that I found to be really good like Mango, and Sweet tropical.